In 1983 Barry Prophet premiered original sound art compositions on Ian Lazarus’ sound sculpture Audio Corridor at the Harbourfront Art Gallery. That same year he and Mr. Lazarus received Canada Council funding to create Ring Chamber, an aluminium percussion performance sculpture containing notes of glass, brass and wood. In 1987 Barry received Ontario Arts Council funding to create The Glass Box, a 5ft.6in. cubic percussion sculpture containing 52 glass notes. Featured in the Ontario Science Centre’s exhibition Handmade for Music (curated by William Laskin), a sample Glass Box Wall toured Ontario’s art galleries as the interactive element of that display for over two years. Barry performed music on the Glass Box with dancer/choreographer Janice Pomer, The Glass Box Show toured from 1988 - 1993 (Provocative, challenging and ultimately riveting. The Canadian Statesman 1992). Duets with Glass audiocassette featuring Barry on the Glass Box was released in 1990. 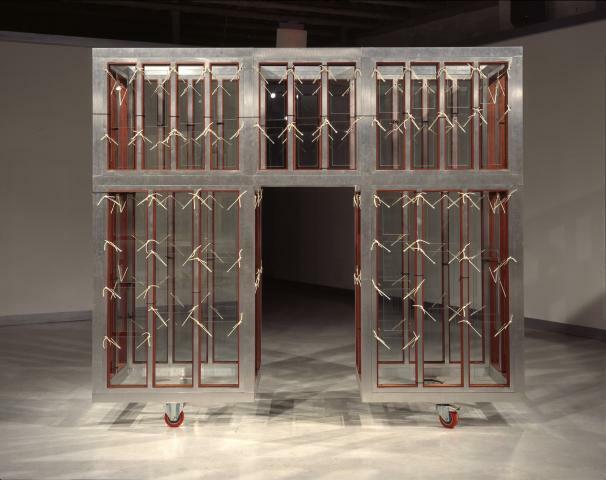 Barry created the Revolving Tone Door in 1991, which along with The Glass Box, was selected to be part of the McMichael Canadian Art Collection’s New Visions exhibition in 1994. The Transparent Tone Arch, a 104 glass note percussion performance sculpture, was created in 1992 with the assistance of the Laidlaw Foundation & Ontario Arts Council. Barry’s chime sculptures are in private collections in North America and have been displayed at the Thunder Bay Art Gallery, the Ontario Crafts Council, Harbourfront Craft Shop, Canadian Sculpture Centre and the Music Gallery. Barry received a Canada Council grant to create glass lithophones, 1996. Barry and Janice launched their CD Crystal Bones at the month long Pekao Gallery retrospective exhibition of Barry’s sound sculptures including the premier of Sonic Hereafter, Nov. 1997. Barry and Janice presented new music compositions with the premier of Bamboo Quiver (sculpture for dancer) at the Tree Museum, Muskoka, ON Sept 2002. On October 21 2006 Barry's integrated arts installation Dwellings and Incursions opened at Rail's End Gallery (Haliburtion, ON). 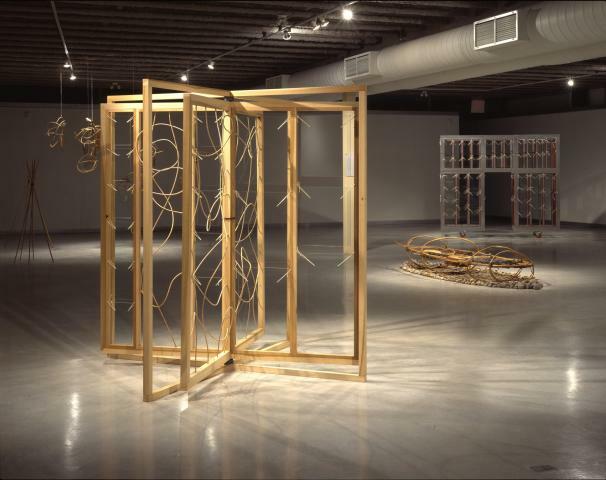 The exhibit featured rattan sculptures, mono-prints, sound art and video/media art. During the same 4 weeks the Haliburton Sculpture Forest presented Barry's outdoor installation Alatus Rising which opened with a music/movement performance event by Barry, dancer/choreographer Janice Pomer. OAC Exhibition Assistance. Barry’s cyanotype collage Snakes & Soldiers exhibited in the group show Forest for the Trees curated by the Intersperse Curatorial Collective at the Lonsdale Gallery Toronto 2006, 'Il Gabbiano' in La Spezia, Italy 2007, StFX University Art Gallery. Antigonish NS 2008. Dwellings & Incursions: Natural Selection & Community the Artist’s Photographic Book & CD project received research and development support from the Multi-Arts section of the Ontario Arts Council 2008. Barry's Black Quiver was installed at MacLaren Art Centre as part of Barrie Ontario’s summer art exhibit Urban Visions 07. Barry’s seasonally permanent outdoor bike powered electro-acoustic sculpture, Synthecycletron, commissioned by New Adventures in Sound Art, opened November 2007 and continues to be exhibited on Toronto Centre Island. OAC Exhibition Assistance. Sound Booth was funded by the Canada Council for the Arts & the Ontario Arts Council in 2009 as an acoustic sound art generator to build capacity for Barry’s on going sound art creation. A simple version of Sound Booth was created as a site specific installation at Ice Follies 2010 hosted W.K.P. Kennedy Gallery on Lake Nipissing North Bay Feb. 13-Mar.12. Toronto (new music) Marathon Sept. 25, 2010 at Yonge/Dundas Square hosted by Contact Contemporary Music. Barry's Rotary Mbira (component of Sound Booth Project) was featured at the 8 hour event as an interactive sound sculpture/sound art demonstration. The Chain Reaction Project is an exploration of materials, mechanisms, microcontrollers and their applications to interactive, portable, public sound sculptures, supported by the Multi-Arts Office of the Ontario Arts Council Feb. 2011 and the Inter-Arts office of the Canada Council for the Arts Aug. 2011. Chain Reaction Project interactive exhibition of Ontario Arts Council & Canada Council for the Arts supported project work product by Barry Prophet. This day long presentation of interactive kinetic sound sculptures, Arduino micro-controller based sound/sensor projects and bread board synthesizers was hosted by Musideum at 401 Richmond St.W. Toronto May 26, 2012. Black Quiver Plugged In, an interactive sound sculpture installation by Barry Prophet at the Roncesvalles Village street festival Roncy Rocks June 16, 2012, 10am to 6pm. Black Quiver is an interactive sound sculpture that was first installed at MacLaren Art Centre, as part of Barrie Ontario’s summer art exhibit Urban Visions 07. The Black Quiver sounds were processed through computer controlled effects enabling festival visitors of all ages to play on the Quiver and hear both acoustic and electronically altered sounds. Serpentine Pipe-way from the Chain Reaction Project and chime sculptures by Barry Prophet created a diverse range of sound sculpture experiences.